In this section you'll create a template for editing dates that will be applied when ASP.NET MVC displays UI for editing model properties that are marked with the Date enumeration of the DataType attribute. The template will render only the date; time will not be displayed. In the template you'll use the jQuery UI Datepicker popup calendar to provide a way to edit dates. This code causes the ReleaseDate field to be displayed without the time in both display templates and edit templates. 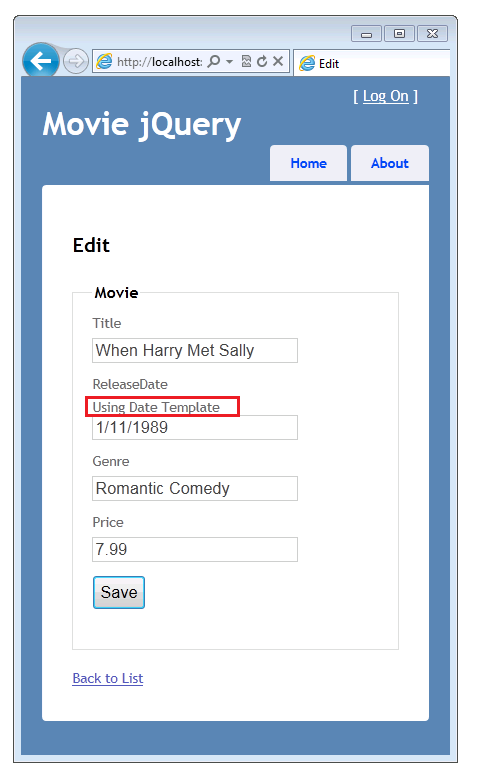 If your application contains a date.cshtml template in the Views\Shared\EditorTemplates folder or in the Views\Movies\EditorTemplates folder, that template will be used to render any DateTime property while editing. Otherwise the built-in ASP.NET templating system will display the property as a date. Press CTRL+F5 to run the application. Select an edit link to verify that the input field for the release date is showing only the date. In Solution Explorer, expand the Views folder, expand the Shared folder, and then right-click the Views\Shared\EditorTemplates folder. Click Add, and then click View. The Add View dialog box is displayed. In the View name box, type "Date". Select the Create as a partial view check box. Make sure that the Use a layout or master page and Create a strongly-typed view check boxes are not selected. Click Add. The Views\Shared\EditorTemplates\Date.cshtml template is created. Add the following code to the Views\Shared\EditorTemplates\Date.cshtml template. The first line declares the model to be a DateTime type. Although you don't need to declare the model type in edit and display templates, it's a best practice so that you get compile-time checking of the model being passed to the view. (Another benefit is that you then get IntelliSense for the model in the view in Visual Studio.) If the model type is not declared, ASP.NET MVC considers it a dynamic type and there's no compile-time type checking. If you declare the model to be a DateTime type, it becomes strongly typed. The second line is just literal HTML markup that displays "Using Date Template" before a date field. You'll use this line temporarily to verify that this date template is being used. In your browser, view the source of the page. (For example, right-click the page and select View source.) The following example shows some of the markup for the page, illustrating the class and type attributes in the rendered HTML. First, you have to install the jQuery UI libraries. To do that, you'll use NuGet, which is a package manager that's included in SP1 versions of Visual Studio 2010 and Visual Web Developer. 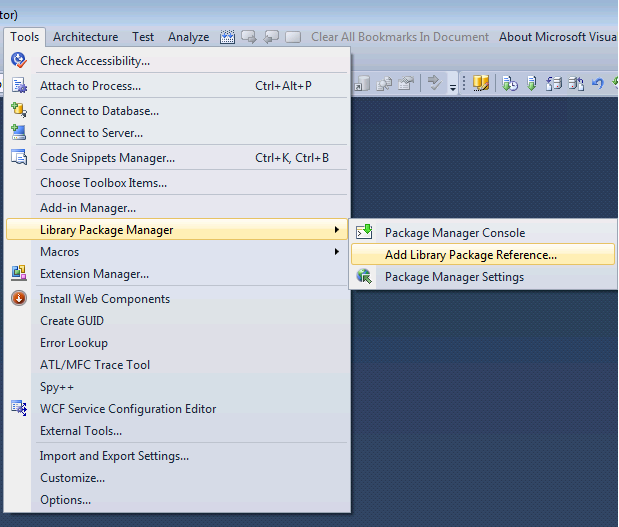 In Visual Web Developer, from the Tools menu, select NuGet Package Manager and then select Manage NuGet Packages. Note: If the Tools menu doesn't display the NuGet Package Manager command, you need to install NuGet by following the instructions on the Installing NuGet page of the NuGet website. If you're using Visual Studio instead of Visual Web Developer, from the Tools menu, select NuGet Package Manager and then select Add Library Package Reference. 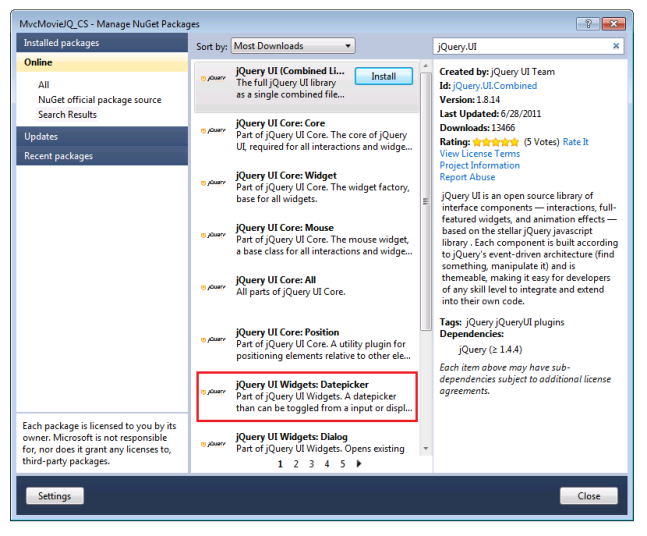 In the MVCMovie - Manage NuGet Packages dialog box, click the Online tab on the left and then enter "jQuery.UI" in the search box. Select j Query UI Widgets:Datepicker, then select the Install button. Note: The debug versions (the files without the .min.js extension) are useful for debugging, but in a production site, you'd include only the minified versions. To actually use the jQuery date picker, you need to create a jQuery script that will hook up the calendar widget to the edit template. In Solution Explorer, right-click the Scripts folder and select Add, then New Item, and then JScript File. Name the file DatePickerReady.js. The following example shows the actual code that you should add at the bottom of the head element in the Views\Shared\_Layout.cshtml file. The URL content helper method converts the resource path to an absolute path. You must use @URL.Content to correctly reference these resources when the application is running on IIS. Press CTRL+F5 to run the application. Select an edit link, then put the insertion point into the ReleaseDate field. The jQuery UI popup calendar is displayed. 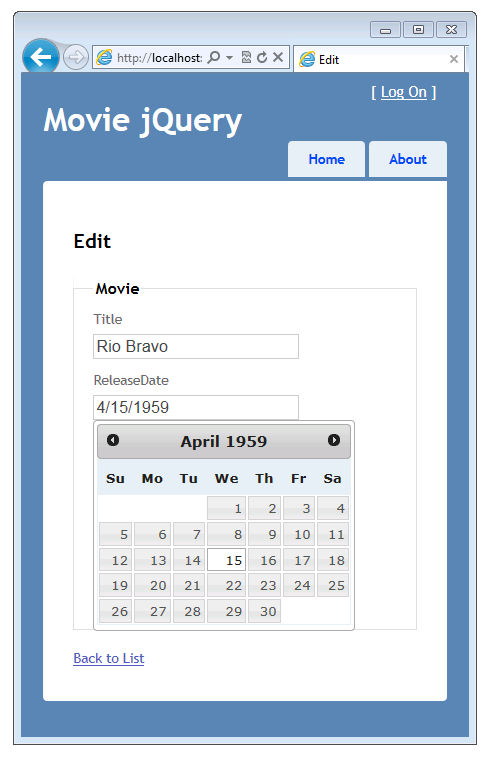 Like most jQuery controls, the datepicker lets you customize it extensively. For information, see Visual Customization: Designing a jQuery UI theme on the jQuery UI site. Because new versions of browsers are implementing HTML5 incrementally, a good approach for now is to add code to your website that accommodates a wide variety of HTML5 support. For example, a more robust DatePickerReady.js script is shown below that lets your site support browsers that only partially support the HTML5 date control. This script selects HTML5 input elements of type date that don't fully support the HTML5 date control. 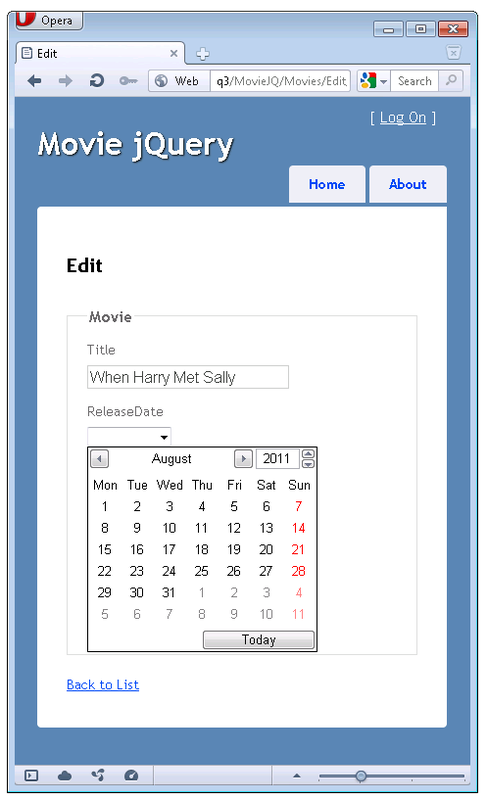 For those elements, it hooks up the jQuery UI popup calendar and then changes the type attribute from date to text. By changing the type attribute from date to text, partial HTML5 date support is eliminated. An even more robust DatePickerReady.js script can be found at JSFIDDLE. The code returns an empty string when the model is null. When this code runs, if the model is not null, the model's DateTime value is used. If the model is null, the current date is used instead. For information on localization, see Rajeesh's blog JQueryUI Datepicker in ASP.NET MVC. 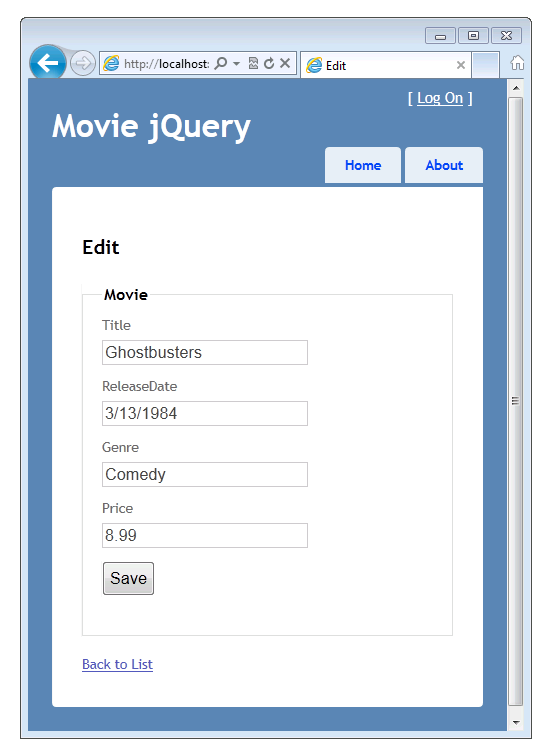 For information about jQuery UI, see jQuery UI. For information about how to localize the datepicker control, see UI/Datepicker/Localization. For more information about the ASP.NET MVC templates, see Brad Wilson's blog series on ASP.NET MVC 2 Templates. Although the series was written for ASP.NET MVC 2, the material still applies for the current version of ASP.NET MVC.